Why was Collective Invention (CI) created? How does CI compare to other innovation consultancies? What about CI is transferable to your design practice? 4:30-5:00pm EST Student dyads discuss your reactions, thoughts, questions about Collective Invention. 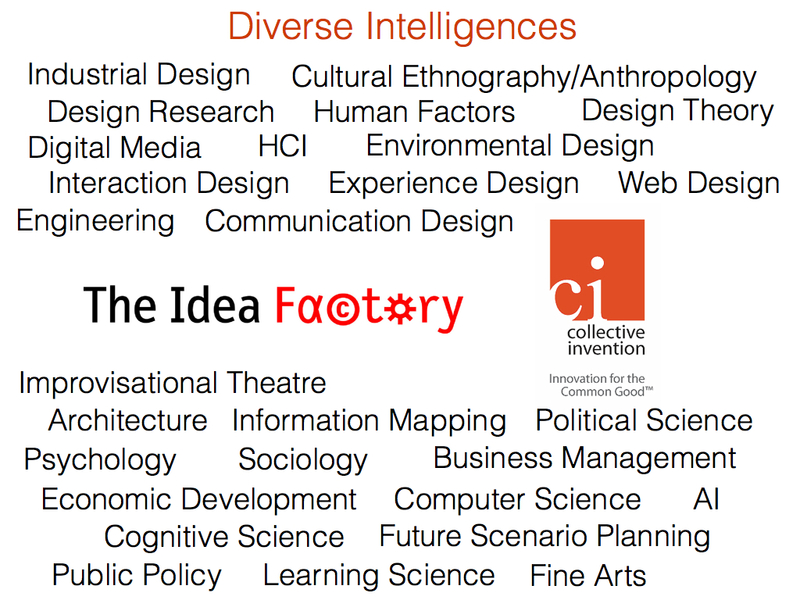 Make a concept map of what Collective Invention is and does (refer to concrete examples of work). 1) Upload your concept maps to your personal page on the course wiki as an image. 2) bring a hard-copy of concept map to class. Be able to discuss in class: What we like, don’t like, question, would change, agree with, disagree with, don’t understand, want to know more about. Compare, Contrast, Evaluate, Good/Not good about CI vs other innovation consultancies you may know about. Dyads present their revised concept maps. Post concept maps on the wall. Please upload updated concept maps or revised concept maps to your personal pages on the course wiki. 5:00-6:00 EST Teleconference discussion with Erika Gregory, President of CI and Fiona Hovenden, VP for Research. Dyads capture responses to their questions in concept maps. Post concept maps on wall. DRIVING QUESTION: How can we design for a world we want in a future shaped by forces we can’t predict or control? 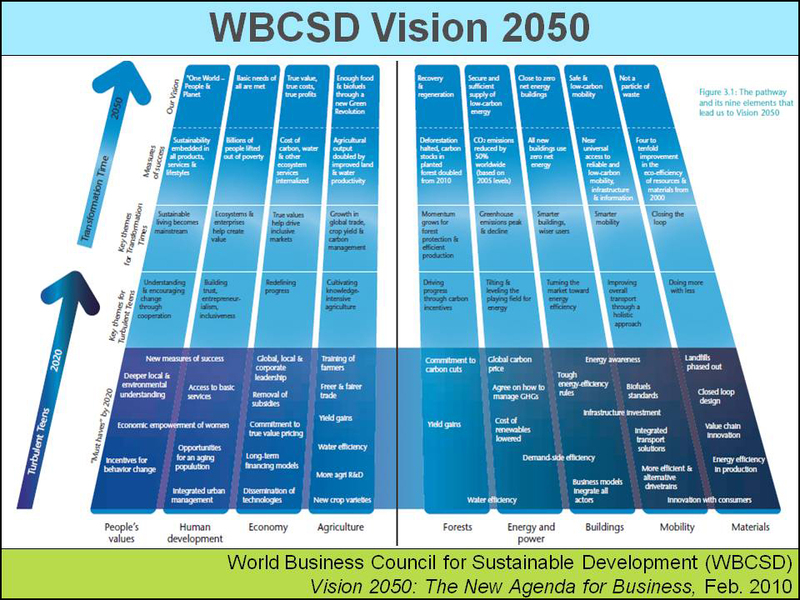 Prepare to contrast & compare evaluate & discuss World Business Council for Sustainable Development (WBCSD) Vision 2050 and other future visioning organizations and their work. What are international organizations like these trying to accomplish? Some, like WBCSD, are sponsored by corporations. Many, like the European Centre on Sustainable Production and Consumption (CSCP) are intergovernmental consortia. Others, like the World Economic Forum (WEF) are cross-sector Non-Governmental Organizations (NGOs) (business, political, academic, etc.). Still others are sector-specific, like the New Media Consortium (NMC). And there are many futures think tanks like Global Business Network (GBN) and Institute For the Future (IFTF). What are the intentions and impacts of the work of these organizations? What is good/not good about future vision scenarios? How can designers use and contribute to long horizon vision scenarios? What do you question or want to know more about? How would you make the Vision 2050, the Pathways Map and other WBCSD tools and other futures projects more useful/usable to accelerate & scale diffusion, acceptance, adoption/execution? 2-A. All students view online, browse & download. (1) World Business Council for Sustainable Development (WBCSD) web site: http://www.wbcsd.org/home.aspx. Video WBCSD Montreux 2013 Meeting Highlights http://www.youtube.com/watch?v=OpCrC214lgI. What is WBCSD’s purpose/trying to achieve? Why? What are the intentions and impacts of their work? What are your reactions, thoughts, questions about WBCSD and other future visioning organizations and their work? What organizations are you surprised to find in the WBCSD? What corporations are notably absent? Why do you think such corporations are participating or missing? How might designers use/contribute to long horizon vision scenarios like WBCSD? 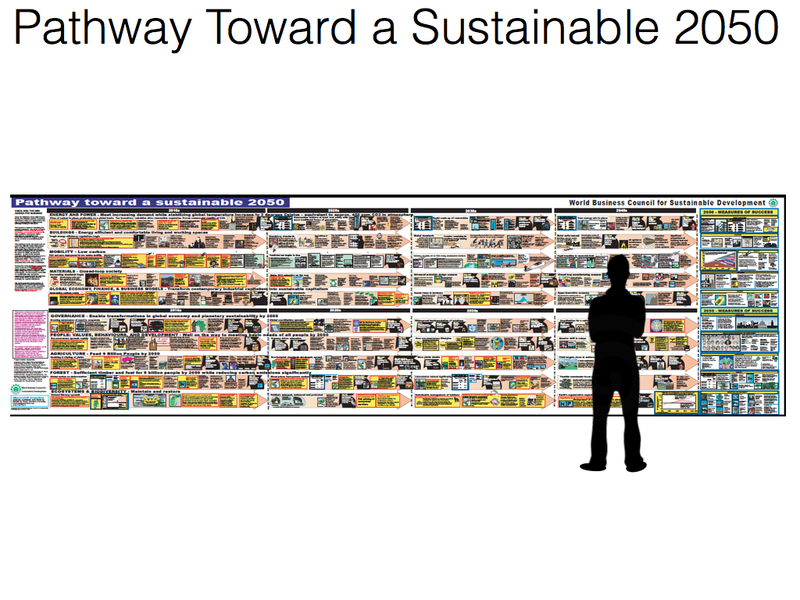 How would you make Vision 2050, the Pathways Map & other WBCSD tools more useful/usable to accelerate & scale diffusion, acceptance, adoption/execution? 2050. It focuses on selected environmental and resource policy areas, specifically: energy; greenhouse gas (GHG) emissions and ozone-depleting substances; air quality and air pollution; transport sector emissions of greenhouse gases and air pollutants; waste; water; sustainable consumption and production (SCP); chemicals; biodiversity and land use. Towards a green economy in Europe.pdf [4.9 MB].